Apart from the wearing of the uniform items, all students are expected to be neat and tidy at all times and only items of uniform may be visible. 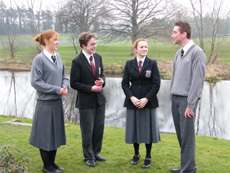 Formal wear is to be worn when students are representing the College, in any College related context, and when attending College celebrations and/or masses. The excuse that a uniform item is in the wash or damaged will not be accepted. All students should have backup items of uniform to cater for such eventualities.